Castle Rock greets visitors at the entrance to Sand Canyon in Canyons of the Ancients National Monument. I often travel to Canyons of the Ancients National Monument in the winter months to ride my horse, hike and bicycle. 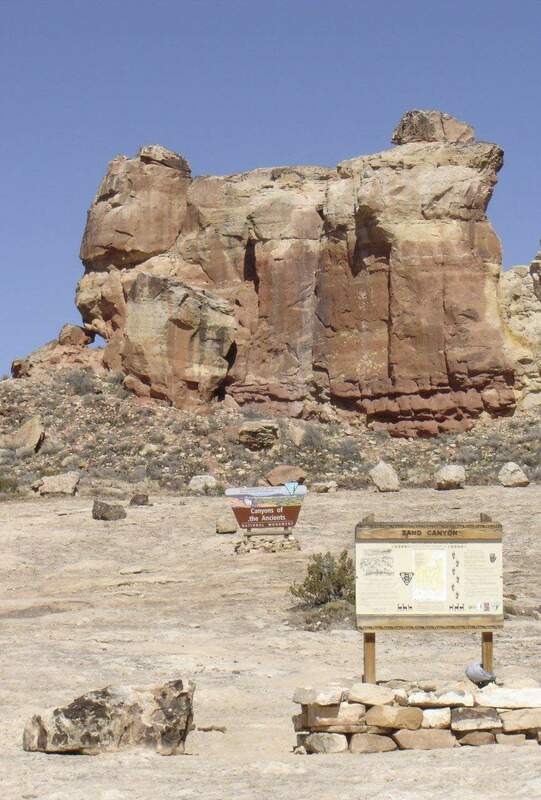 Sand Canyon, a recreation area in the monument, is one of my favorite areas, and judging by the number of cars and trailers in the parking lot, others feel the same way. Since its designation by President Clinton in 2000, the Bureau of Land Management has been working on a management plan for Canyons of the Ancients. After 10 years of studies, seeking public input and numerous revisions, the plan is complete and is being implemented with the No. 1 priority being to protect the vast cultural resources within the monuments boundaries. This means there is new information that visitors need to travel and recreate in the monument appropriately. The outdoor museum concept has been adopted by the Monument so visitors can experience cultural and natural resources through self-discovery. Minimal development occurs, and therefore there are limited facilities and interpretive materials. For complete information about your visit, you should start at the Anasazi Heritage Center or, at a minimum, visit the BLM website, www.blm.gov/co/st/en/nm/canm/blm-canm-visitor_information.html. b If a road is gated, can I still access that road? Locked gates means use is restricted and may not be open to the general public for motorized use but may be open to horseback riding, hiking and, in some cases, bicycling. b Can I camp in the monument? Can I have a campfire? Camping and campfires are prohibited in front-country recreation areas (i.e. pueblo sites, Sand Canyon/Rock Creek). Campfires are allowed in the backcountry but are prohibited in archaeological sites and within 300 feet of water sources and developed areas (trails, kiosks, parking areas, etc.). Fire pans are mandatory for campfires. b Can I ride an ATV? Are there maps/trails? Motorized and mechanized travel is restricted to designated routes in the monument. Cross county travel is prohibited. Maps are available at the Anasazi Heritage Center or online. b Can I hunt? Yes, and it is regulated by the Colorado Department of Wildlife. b Can I carry or shoot firearms/target shoot? Recreational shooting such as target shooting with bullets, bow and arrow, paintballs and air guns or other means is prohibited. This does not include hunting. b Is rock climbing allowed? Climbing (rock climbing, rappelling and/or bouldering) is allowed only in designated areas in the Mockingbird Mesa Recreation Management Area. b Is geocaching allowed? No. b Can I hike/bike/horseback ride in the monument? Hiking and horseback riding are allowed on both routes and cross country travel but is restricted to designated routes in the Sand Canyon/Rock Creek area. Bicycling is restricted to designated routes only. b Can I cut firewood? No personal-use firewood cutting is allowed in the monument. Commercial fuel wood cutting requires a permit. b What is the proper way to explore a backcountry site? Visit with respect. Many sites hold spiritual value for Native Americans. Avoid leaning or walking on walls; do not touch artwork or eat in sites; leave artifacts where you find them; no digging; and stay on existing routes or trails. Enjoy your visit to the monument, and remember to visit with respect. Kathe Hayes is the volunteer program director for the San Juan Mountains Association. For information about volunteer programs at Canyons of the Ancients National Monument  including trail information specialists for Sand Canyon, wilderness study area monitoring and National Public Lands Day events  call Volunteer Program Director Kathe Hayes at 385-1310 or e-mail Kathe@sjma.org.